Here’s a TBT post for you – web design style! Back in 2011, one of my goals at my corporate job was to redesign an internal portal page promoting Emerald Connect, the company’s approved website platform for field sales advisors who want to promote their financial services online. It was a huge project to redesign this page due to the comprehensive information and outdated look. Plus, at the time, the company changed web content management systems, so a redesign was required. The redesigned site was created in Vignette (now Open Text). 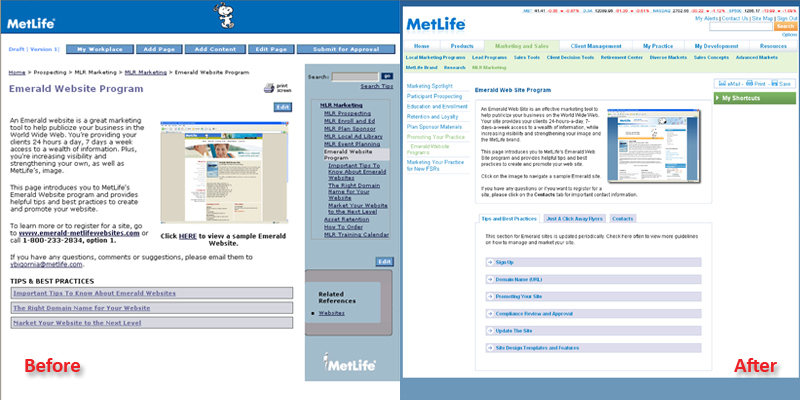 BEFORE: Other than the outdated design interface and drab color scheme, the navigation was also cumbersome. AFTER: With the use of tab structure and dropdown boxes, these features helped breakdown large amounts of copy and keep information more organized. Plus, it also keeps content in one page instead of going to a separate page for more information. To see the latest design pieces, please check out the Portfolio.